Refresh your home with green hues from Krylon® to celebrate St. Patrick's Day! 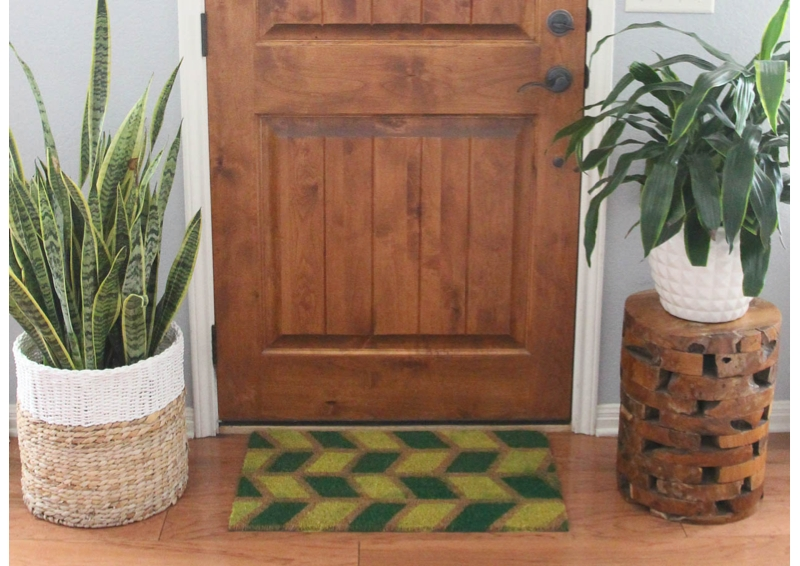 Using painter's tape, start by creating four 4.5 inch sections lengthwise across the doormat. To create the geometric, herringbone pattern, space out diagonal pieces of tape about 3.5" apart within the 4.5 inch sections, and repeat the process within each section or row. Each adjacent row should have the diagonal pieces of tape facing the opposite way to create the herringbone angle. In order to use two colors of paint for this project, fill in every other herringbone 'block' with painter's tape, alternating rows. After reading the safety and application instructions on the can, in a well ventilated area, paint the exposed portion of the mat with Krylon® ColorMaster® Paint + Primer in Gloss Citrus Green. Once the Gloss Citrus Green is dry to the touch, remove the painters tape from the covered herringbone "blocks" or sections, while ensuring that the tape for the overall geometric design remains intact. Once the Gloss Citrus Green sections are completely dry, tape over those areas with painter’s tape and repeat the same process on the unpainted sections using Krylon® ColorMaster® Paint + Primer in Gloss Emerald Green. Once the Emerald Green sections are dry to the touch, remove all painter's tape form the mat. Allow the spray paint to fully dry before using the doormat. Enjoy!